So, is that a quick release or what? Xavier Cedeno, he who has faced exactly 15 batters this season, was DFA’d ahead of the Tuesday 4/14/15 game as first reported by Mark Zuckerman on twitter. In those 15 batters, he gave up 3 hits, 2 walks, one HBP, struck out 4 and got the other 5 guys out somehow. Oh and he threw two wild pitches. Those numbers totaled a 6.00 ERA, a 1.667 WHIP and an even higher FIP. But more importantly, it spelled his DFA (since he’s out of options and until a week ago everyone thought he had beaten out Jerry Blevins for the bullpen). It is hard to argue with this observation because its true. Yesterday we were wondering why the heck Matt Williams was pitching Cedeno for the 4th time in 5 days despite being 5 runs down in a losing cause … today he’s DFA’d. What he heck is going on?? In January, I never would have thought that Cedeno had a shot at the team anyway … but I also wouldn’t have thought the team would have dumped Blevins for a 4-A outfielder who we probably didn’t need in a move that smacked of pettiness over the outcome of the off-season’s arbitration result (I reference Ken Rosenthal‘s tweet on the matter here). Den Dekker is the TENTH outfielder on our current 40-man roster; the only “real” infielder who isn’t already on the MLB bench in the entire system is Wilmer Difo. To say that the team has a slight imbalance of players on its 40-man right now is an understatement. Anyway. To the good news. Long-serving and well-deserving RHP reliever Rafael Martin has been called up, added to the 40- and 25-man and will join the team in Boston. He more than earned this spot with his excellent 2014 numbers, and his career path is the stuff of movies. I say bravo to the Nats for finally recognizing his great minor league performances, and I hope he sticks around. « Arizona management: Get off my Lawn! Subscribe to comments with RSS or TrackBack to 'Forensicane’s campaign finally fulfilled; Rafael Martin called up & Cedeno axed'. Todd, you had the name wrong. It’s Rafael ‘Beer League’ Martin. You’re right, this is a story that movies are made of. Only baseball can provide this kind of narrative, it’s incredibly heartwarming. Great observation on the disjointed 40 man. I had not connected the dots. I feel for you on having to pull the Big 4 post. There will be slow days where it will really come in handy. I don’t know Martin other than Forensicane’s comments, but I hope that he does well and certainly, it is a great back story. But I’ll have to see him myself before rendering an opinion. I wasn’t a fan of the Blevins trade. It seemed like most people were, but I thought that he was a solid, veteran relief guy (and I think this narrative about a $200k ‘spite’ trade is nonsense). He was clearly no star, but losing him and Clip took away some talent but also more importantly two guys who have been through some wars. In this kind of year, I think those guys are important. I say that, yet I don’t dislike den Dekker, and can see some value that he can add as a role player. I just think it was a tactical mistake to start the season with all of Cedeno, Treinen and Barrett all in the pen, even though they have good stuff, because of their lack of experience. So hopefully Martin, and then later Grace, can be solid, but I think there will be some trades coming in the next couple of months. My best guess is that they make a bigger move for a closer, and push Storen down into Clip’s role. I just hope it isn’t Papelbon. And unrelated to this, I think Taylor’s debut has been just ok. Hitting is weak but not horrible, with enough success that he can feel confident. but he doesn’t look as good defensively as advertised. It may be that he isn’t confident taking charge yet, but he will need to do so to be effective. Hopefully he can maintain his batting line for another 10 days, and Span comes back so he can go down to AAA and build off this with a feeling like he can succeed. Wally-be prepared to be blown away by Taylor’s defense. He’s that good. He just turned 24, so there’s going to rookie issues, no matter who. The good news for the Nats bullpen is the ‘bench’ still has Hill & Grace ready if needed. Good grief, that was hard to watch. Treinen actually pitched well (after the HBP) and got three weak grounders but wil probably be scarred by that inning. Parents, don’t let your children watch this team! Ugh. If MW had any cojones, he’d bench Desmond for a game or two. At some point, “shake it off” doesn’t cut it. I never thought Cedeno would make the team. He can be a major-leaguer for half the MLB clubs, though, so he would have been worth something in trade in the offseason or even in the spring. Not much, but something. Now, in DFA desperation, they’ll be lucky to get a couple of broken bats for him. I have no idea what the deal was with Blevins, but there have been reports that things got chippy over arbitration. Frankly, most thought Blevins didn’t pitch well enough last year to be on the postseason roster. He was a bit of a disappointment. The only issue was that the Nats didn’t have many other LH options. I don’t hate the trade, though. The Nats got Blevins for Billy Burns and then flipped Blevins for den Dekker, who clearly has more of an MLB future than Burns. So it’s been a positive. I would have kept den Dekker over Reed J., but then I’m tired of the broken-down bench retreads. Speaking of such guys, I still cling to some hope for Uggla, although I’m sure I’m in the minority. He’s hit the ball hard a few times and has looked more comfortable at the plate than T-Mo. As for excusing Taylor’s mistakes because he’s young, remember that he’s six months older than Bryce! But he’s six years younger than Martin or Robinson, both of whom are good stories. Robinson looks like a keeper. Infielders: for what it’s worth, Jason Martinson is showing some signs of resurrection at Syracuse. There aren’t many other real prospects on the horizon, though, unless you count Difo and He Who Shall Not be Named. They put up with Danny because they have no choice. Where have you gone, Tony Two-Bags? Nats Nation turns its lonely eyes to you. Well, I do have the apples of my eye The only thing I am going to say is that Martin was #5 on my personal Nats prospect list. (#6 is Grace, FWIW). Uggla is good as gone. He is a one-dimensional player at one position. 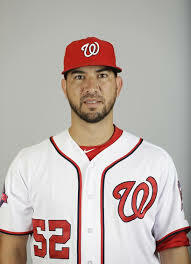 I am no fan of Espinosa, but he has only two strikeouts in ten plate appearances so far and is not at all the reason the teams stinks right now. And as for the talk of his being selfish, etc, really, does anyone want him to succeed more than he does? all of this is a reminder that while we all think, including myself, that we know who is capable and who is the strong horse, once the games start, everything reveals itself. The intangible no one projected was the impact of unsettled contract status might have on Desmond and Zimmerman. Desmond is really hurting the team and the decision to play the season with no contract, for him and others, should be the discussion of the braintrust. As for Taylor, he is still playing well above what anyone expected for April 2015, and he is still a quick learner. Sky is the limit. As for Martinson, he is easy to love because he has power, speed, and can field shortstop well enough. But beware — he is a notoriously streaky hitter who racks up gobs of strikeouts. I’d love to see him succeed, especially now. But let’s see where he is in June-July even, and then I’ll know if I am a believer. Whom we should be raising an eyebrow to is Tony Renda. He plays second better than Uggla, and may not have power, but he sure can hit. And like Martin, and others I’ve fallen for here while they were overlooked minor league talents (like Barrett, Roark, and Souza), he just keep proving folks wrong every level up. The system has lots of bullpen talent. Something will click there. I’m still more worried about the hitting and Ian Desmond’s mind. Another guy no one is talking about who should be on our radar is Robert Benincasa. He was a closer of the future and projected fast riser since being drafted after dominating in college, but a notorious underachiever in his pro career thus far. Well, he is sure looking good in the early going. Again, the cupboard has a lot more than the Manny Delcarmens. Lastly, Span is coming back to the major league lineup this week, as early as tomorrow. They won with him last year. When Span returns, who goes? Taylor (to AAA), T-Mo (to DFA), or Reed J. (to the glue factory)? My guess is that they’ll send Taylor to Syracuse even though he’s clearly the best player among the three. If Span is back tomorrow … I think you keep Taylor and DFA somebody else. I mean, Reed Johnson was signed, what, 15 minutes before the season started? I’m sure he’ll clear waivers. Stammen to DL, Jordan up. Lost another veteran arm, maybe for a while (forearm tightness). I would have brought up Grace or Hill, personally. Not sure who the SP depth will be if they keep Roark, Treinen and Jordan pitching in the pen for too long. I am still concerned that they may be hindering Treinen and Barrett by pitching them in too many high leverage spots until they show more success in the low leverage ones. Agree here: why is Jordan (a starter) being called up to replace a 7th inning guy (Stammen)? That makes no sense. Now …. calling up Martin to replace Stammen, that’s 1 for 1, like for like. But that’s not the order the transactions happened. And even if that was the case, then you’re replacing a loogy (Cedeno) with a … starter in Jordan? If they’re not trusting Treinen or Barrett … and Stammen’s hurt … and Roark is a long man … and Cedeno is DFA’d and Thornton is a loogy … well who the heck else is there? Storen’s pitched exactly twice; in their two wins. Maybe this team needs to get rid of the 4-A collection of bats they have and start calling up their actual relievers in AAA. Fornataro. Hill. Meek; all three have MLB experience. Give them a try. Martin’s debut going pretty well … two K’s in his first inning. Holy cow. I hit reply on that comment too soon. Martin struck out the side in the eighth! 2 ip, 5 Ks. What a debut! Can’t argue with the results, but it was a little odd, wasn’t it? He only hit 90 once, but they looked like they couldn’t pick up his ball. And after hearing so much about his slider, I think he only threw two or three. Seemed like he shook off Ramos quite a bit. Overall, he reminded me of Joel Peralta. We all know Williams has no clue with his pen, but Martin may be the kind of guy to save him. Wow, he was good today, throwing moderately paced pitches. He went after batters and the results were clear. SMH about Jordan coming up for the pen – definitely had to be Hill or Grace – did MW give an explanation for that? I haven’t heard an explanation on it. My guess is that they want to move Roark into more high leverage situations, and needed a long man. I understand that, I guess. Not how I would do it, but not crazy. But my original concern remains: if you put Roark into that situation, and Jordan into erratic, long man use, neither guy will be able to step right in as a replacement for an injured starter (and Treinen is already in that spot, never having been stretched out in ST). You are left with Cole, and maybe Hill (whom I don’t like as a SP very much). Pretty thin. Listening to talk radio this am; masn beat reporter kind of gave a mini scouting report on Martin. Tons of movement, very crafty guy who has great command and varies his speeds well. I like the Peralta comp. Roark moving “up the chain” in the bullpen; interesting theory. I could see it I guess … Roark can bring it a bit more in shorter stints. But then if Jordan is recovering from TJ and needs to get regular work, why the F bring him up to the majors where he might only get a few innings a week?? You put a MLB min veteran (ahem, Ross Ohlendorf) in that role, not a prospect/younger guy who may actually be a serviceable starter. Hanley seemeds rather frustrated with the fact that he was throwing through the shadows … something to consider. Ramirez was so far behind a 90mph fastball that he looked like a little leaguer. Otherwise, the pitches these guys watched go by were perfectly placed at the knees, very hard to hit no matter how fast it goes. One great slider to get Victorino. I like this guy. The Jordan callup, with Grace right there, is a real puzzlement. Wally’s explanation makes sense to me about Roark, but that’s only part of the story. As for Jordan, I am starting to think that between him and Treinen, they are giving players time in the majors to help the mental transition for players who are almost there, and who may conquer the minors and need extra oomph to have the mental edge at the top level. It certainly tells us that Jordan is back to where he was two years ago to have him called up ahead of an apparent team need like left handed LOOGY relief. I also think the team is still shopping Zimmerman, and that’s why Rizzo did that interview in the Boston Herald the other day. Plenty of auditioning going on for a team that is not yet settled by any means. By this time next week, Span will be back in the lineup. In two weeks time, we’ll be seeing Rendon, perhaps. Who knows what the roster will look like? Taylor with one or two days to make a last impression. Ten runs scored turns any manager into an award winner. A couple of quick points…Chris Bostick with 4 SB. Austen Williams with another fine start. And two no hitters against the Nats organization in one day? An offensive drought all through the organization — or the need for better hitting instruction? Ugh. Great debut by Martin – if he could turn into another Joel Peralta, that would obviously be pretty awesome. On the bullpen machinations, although the timing of the callus looks like one thing (Martin for Cedeno, Jordan for Stammen) that doesn’t mean that they are replacing roles for roles. I expect more moves as the team goes through various bullpen alignments through the early part of the season as the team figures out the final bullpen structure. The guys running the personnel side of the organization are clearly pretty smart (the results speak for themselves), so I’m willing to entertain the notion that they aren’t just throwing a dart at Syracuse’s roster and taking whoever it lands on. Well, if the team is still shopping Zimmerman, cross one huge suitor off his potential buyer’s list (Boston). You don’t make many fans by giving up 9runs in 2 innings. In fact, its hard to see a team out there who would make sense as a trade partner for someone like Zimmermann, especially mid season. Detroit? worst farm system in the majors; who they got to move that we like? Yankees? They seem to be in a “wait out our bad contracts” mode. Oakland? Only if they’re in contention at the trade deadline. Seattle? tapped out in payroll? Cubs? they’re in a building mode, not a buying mode. I dunno. Why would the nats, in a “win now” mode, look to move their 2nd best starter in the middle of a pennant season?? Wouldn’t you rather keep him for the 2nd and 5th game of the playoffs? They know him better than we know him. And I am just commenting on the article and its tone. Has Rizzo EVER given an interview on ANY trading partner for a specific player before? Our stealth Rizzo? Who was completely dismissive of the Cubs discussions? That’s not an accident. The Red Sox can see beyond one bad start. Especially because they were tipped off by Sandy Leon. Zimmerman did not have it/Red Sox had great advance scouting. I think Desmond’s bad start is a byproduct of his situation being unsettled. And I think they have to factor in what the impact on the team will be of having so many players in limbo. It isn’t so simple as play for today and turn it over next year with players you HOPE will be able to carry forward. that’s why the Sherzer signing was so valuable and so smart. And, why getting value for Clippard was so important. The “win now” mode is just talk. We would all be perfectly comfortable with Roark in the starting rotation. Maybe the Nats are thinking about Roark #5 and Jordan #6? Whatever the case may be, if you are in the mode of “keeping Zimmerman because you want to win now,” this GM does not give interviews saying that the Red Sox made offers the Nats seriously considered (because they were close but not enough). That’s a contradiction, and noted by the Rangers and Yankees and Padres and other teams with aggressive front offices. The most important consequence of the Escobar start is that it may prove to secure him as a SS option. The fact that he is hitting/walking at a time that he is playing out of position and with less support in the lineup is unusually impressive, especially given concerns about his decline and more particularly, his attitude. If he keeps it up we will be reminded of why we like Rizzo. Red Sox: “What? Six cheap years of Betts for one expensive year of Zimmermann? Are you nuts? At this point I don’t believe there are any discussions on the table. Especially with the bats struggling, the Nats are going to ride their pitching surplus as far as they can go. And the other half side of the bullpen coin drops today, Felipe Rivero called up for the Phillies series. Not clear who is going back down, likely Taylor Jordan again. Wagner is now reporting that Rivero is being called up, although he doesn’t say who is being sent down. All very curious. I’m guessing Rivero got the call over Grace because he is on the 40-man. Grace was lights-out in the spring. Obviously the Nats are not happy with their bullpen. The Jordan call-up really surprised me. They’ve now got three starters in the ‘pen, four if you count Rivero. That would be a rotation better than at least a third of the league could field. At any rate, perhaps they are just taking the approach of best arm available. (If so, then why Jordan over Cole?) We’ll see. Someone here (Wally?) has long been an advocate of doing like the Cards and some others and bringing up the hard-throwing starters to use in the ‘pen. Once the Nats’ starters get in rhythm and are going at least seven in practically every start, I’m not really that “worried” about the bullpen. Barrett, Treinen, and Thornton are good 7th/8th guys, and perhaps Beer League Martin will get in that mix. But there’s still some role-sorting to do. Roark can step in for Stammen, and Janssen should be ready eventually. John was posting at the same time I was. I agree with him that I have a hard time seeing a J-Zim deal being on the table right now. If it is, it likely would be more a case of a team in real need coming to the Nats with an offer too good to refuse. It’s not going to be Betts. It was never going to be Betts. So taylor Jordan was, what, starter insurance for the final day of the Boston series? Weird. Maybe Rizzo had to give him a birthday present and didn’t want to mail it, so he called him up for a day so he could hand deliver it. KW: Rivero AND Grace are both on 40-man; both call-ups wouldn’t have required a corresponding move (you know, like putting Davis on the 60-day DL where he already should be). You’re right, Grace is on the 40-man. I have no idea why Rivero is getting the call over him. Grace was significantly better in the spring, and Rivero got rocked in his first appearance at Syracuse. Is Jordan being sent out in favor of Rivero? It would be nuts to burn an option like that. Well … Jordan was already optioned to AAA at the beginning of the season. I think he’s burning one in 2015 unless a bus hits half our rotation in the next week. But Rivero over Grace is odd indeed. Especially given where they both pitched last year (AAA versus AA) and how well they both pitched last year (Grace > Rivero). Was Jordan officially in uniform/called up, or was it just discussed? Maybe they did a two-step and reversed field before making the callup of Jordan official. Of course, if someone else goes down, like Treinen back to the starting rotation, then this will not look so discombobulated. Well, good for Rivero. He was looking like a flameout as recently as late last year…. or Barrett or Treinen to go down to Cuse to refine as 8th inning-9th inning guys…. I forgot that you have to be up for a couple of weeks for it to count as burning another option, or something like that. They had used Roark for 3.2 on Mon., so I guess they did need “long-man” insurance for Wed. Anyway, Rivero’s call-up does confirm my suspicion that he wasn’t starting in AAA because they were prepping him in relief in case Cedeno didn’t work out. I don’t know why they don’t trust Grace. Time to start turning things around. The Boston trip was terrible, even though the team managed a win. It’s hard to be happy after giving up 22 runs in three games, five of them unearned. KW: on the flip side … the offense SCORED 21 runs against one of the best teams in the AL … but only got 1 win out of 3. Normally if you average 7 runs a game you’re winning all three games. Baby steps I guess; the problem the first week was offense … then it was pitching. KW – that option explanation, if true, is very helpful, thank you. Maybe they are just that high on Rivero, and it isn’t anything on Grace. Like, we love Souza, but we really, really love Taylor. Option: I think it works in reverse actually. Jordan gets “optioned” to AAA on 4/1. If he’s down for less than 20 days, then the option is reversed. So, so far he was down for 15 days and got called back, so his initial opening day option is now reversed and his clock should start again. If he gets called up, say on 5/1, it’ll be within 20 days again and then if he stays up the rest of 2015, no option used in 2015. I did some of this tedious analysis for my options tracking xls … and even then gave up figuring some guys’ option statuses out. So yesterday was an elaborate way to avoid burning an option for TJ? Evil genius. Andrew: If i have the rules correct, yeah it would be. What if a team called a guy up for one service day every 2 weeks all year. No option. Actually … the rule says “20 total days” not “20 consecutive days.” If it was 20 consecutive days, then every team would frigging call up all their 40-man guys every two weeks. That makes sense. Stephen Souza has the longest home run in the majors so far. 463 Feet. Monster blast. Stammen needs surgery. Torn flexor. Bummer, nice guy and it feels like he has been with us forever. From a baseball perspective, another solid vet missing from the pen. Even though I like the arms of all these kids, I think we need some guys who have been through this before. Literally down to Storen and Thornton as guys with at least 2 years experience. That was the kind of confident performance against the Phils this evening that we expected to be seeing every night. And actually it was pretty efficient to get five runs on only six hits. Thanks for the clarification on the options. I knew it was something about as convoluted as the tax code. Perhaps it’s appropriate that Jordan’s non-option occurred on tax day. Yes, tough news on Stammen. The reports seem to indicate that it would be six months best-case, but more likely the rest of the season. Perhaps he can make it back for the playoffs. I drafted him and Morse. Both are starting to pay off! I’m in a typical early season conundrum. The guys who I would consider dropping were relatively high draft picks (9th, 10th rounders) and were good last year, but have been awful this year and are killing me. Evan Gattis, Chris Carter, Phil Hughes specifically. I’m frozen into inactivity based in indecision… Morse available too but not hitting as well as Souza. There’s other guys worth picking up too; someone just dropped Moustakas for some reason, De Aza is available, Joe Kelly and Nick Martinez both off to good starts. … what would Andrew R do? Tough call. I have Hughes also and he’s not doing well, but I’m holding bc of lack of pitching (I just got Tanaka and keeping my fingers crossed). I don’t think that I’d drop any of those guys you have for Morse. Souza is pretty tantalizing with his power and speed – depends on if you have any other Nats fans in your league – I have a few so I wanted to jump on him before he was taken. Feels like you drafted Carter early – hopefully Gattis had C eligibility to bring up his value. I won my league last year off of drafting Rendon, so I was hoping Souza could be a similar story. We have a ton of Nats fans in my league … and they badly skewed the draft. Scherzer went like #7 overall by way of example. Even guys like Jose Lobaton and Michael Taylor got drafted. Honestly I’m surprised nobody has picked up Souza yet, especially give what he’s done this week. Perhaps its out of sight, out of mind. Carter … yeah … a slight overdraft (9th round, 100th overall) … i kinda got stuck in my draft being way short on hitters and was in a position where I was looking for best hitter available that didn’t overlap one of the positions i had already taken, and Carter was it. Who would have guessed he’d crater like he has to start the season? If i dump him, will someone else snap him up? Probably not: he’s basically a homer-only guy, average blows, no SBs. Maybe he’s worth sacrificing. Screw it: just dropped Carter for Souza. I’m tempted to dump Hughes as well; he’s not going to get Wins on Minnesota. BTW: I’ve had Taylor the past 4 or 5 days – dropped Gyorko who I thought (incorrectly) could hit. Gotta figure out who to pick up with Taylor going back down soon and while I wait for Rendon to come back. Was just offered Stras for Votto. I have Votto (and I have Zimm so I’m covered at first). What do you think? I’m thinking I should do it. Good pitchers seem hard to find this year and Votto feels like he is at peak value. I dunno. Something scares me about Strasburg this year. I guess it depends on what your needs are … Strasburg was my 2nd round pick (late 2nd round) and I only took him b/c I kind of got stuck; wanted Harper and missed by 2, would have taken Rendon if healthy. Pitchers: I always feel like there’s starters on the waiver wire that i’d like. I mean, right now on my league’s SP waiver wire are guys like Joe Kelly, Archie Bradley, Milone (always good at home), Brandon Morrow, etc.